Cliques gives you the ability to track all conversions and actions attributed to your campaign so you can get a real measurement of your campaigns ROI. Action beacons, also known as tracking pixels, page tags, and a myriad of other titles, are a single 1x1 pixel installed in a page--completely invisible--that let us track downstream actions users take on your website. They do not collect personal information, and any information we get through them is used exclusively for providing feedback and analysis about your campaign. Pixels only need to be created once. Once created, the Cliques Console will match impressions/clicks and report Actions for your first and all future campaigns. In order to place a tracking pixel, you will either need to be able to access your site’s HTML or use a pixel management service such as Google Tag Manager. While logged into the Cliques Console, click the "Action Beacons" link in the left menu bar. It is the second from the bottom. 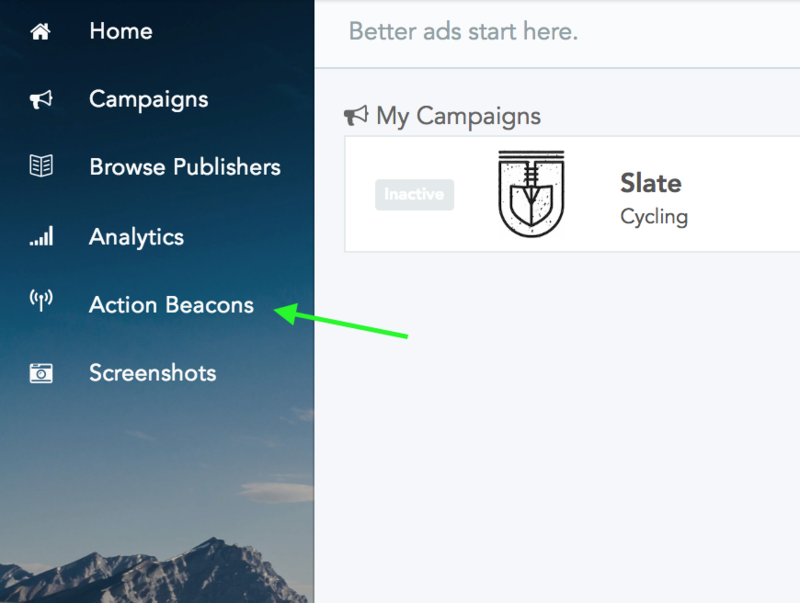 If you're creating a new and/or additional tracking beacon (you can set-up multiple beacons for different actions) click the "Create New Action Beacon" button located in the center of the screen. You'll need to create a name for the beacon, be descriptive about what the beacon is tracking. Example: Shopping Cart Beacon. And just like that, you're tracking beacon is created. Your list of tracking beacons will appear and you can select the "Get Code" button to copy the actual code you will need for you site. If you are placing the pixel on a secure web page, choose the "secure" option. If you're unsure if the page is secure or not, choose the "secure" option. Now that you've created your tracking pixel you will need to copy the snippet of code and paste it on the specific page that you want to track actions to. Example: Don't place the pixel on the "Contact Us" page if you want to track if visitors make it to the shopping cart page of your website. In order to place a tracking pixel, you will either need to be able to access your site’s HTML or use a pixel management service such as Google Tag Manager.